Low odour water-based product that will hold back most stains. 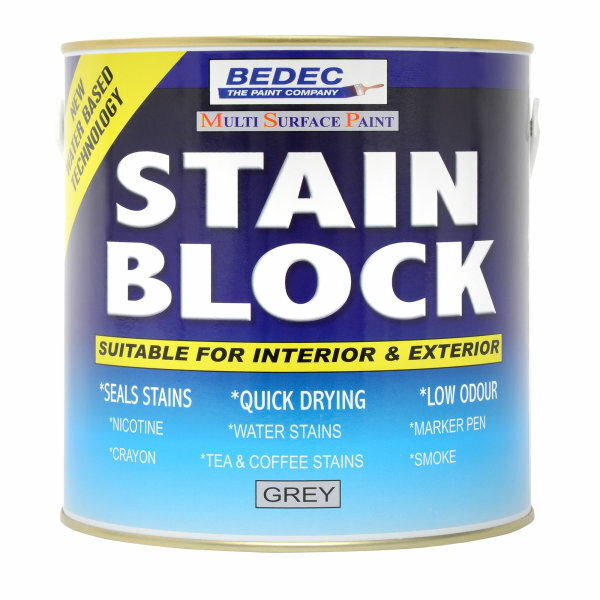 Bedec stain block is a low odour water-based product that will hold back most stains, helping to prevent bleed through staining on new paintwork. Suitable for both interior and exterior surfaces with excellent flow and the added benefit of non-yellowing. 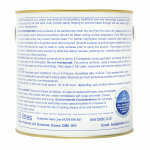 Ideal for use on the following: timber, render, brickwork, concrete and plaster. Touch dry 2-4 hours and recoatable after 4 hours. 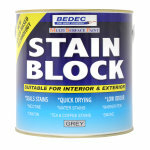 Bedec STAIN BLOCK is a unique new product incorporating traditional and new technology to produce a water based product that will hold back most normal stains helping to prevent bleed through that can cause unsightly staining in new paintwork. Ensure surfaces to be painted are dean, dry and free from dust. dirt, grease and wax. Remove all loose and defective paint. Special precautions should be taken during the preparation of pre 1960's paint surfaces as they may contain harmful lead. Mould, algae and fungal growth should be treated with a fungicidal wash and removed. Smooth and shiny surfaces should be lightly abraded to provide a key. 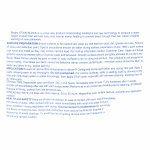 Bedec Metal Primer should be used on steel rusty surfaces prior to using this product. This product is not designed to prevent damp. If surfaces are damp caused by defective damp courses, guttering etc. remedial action should be taken to repair and allow to dry before painting. Ensure air and surface temperature is above 8° Centigrade and humidity is below 80% during application and drying. Stir well and apply 2 coats. Allowing each to dry thoroughly. For porous surfaces, apply a sealing coat by thinning a first coat with 20% clean water or prime accordingly. Then apply 2 full coats, especially with adverse staining, allowing each to dry thoroughly. Drying time - Dependant upon conditions. Dry in 2-4 hours, recoatable after 4 hours. Fully hardened after 2 weeks. Clean up - Immediately after use with warm soapy water. Remove as much product as possible prior to cleaning. Transport and store in a secure upright position, replace lid firmly, protect from low temperatures. Spreading rate - 12 to 14 m2 per litre, depending upon surface texture, porosity and method of application. Wise Precautions - Keep out of the reach of children. Ensure good ventilation during application and drying.